I was getting sick of previewing my project while working on it. Plus, I needed more people using it so I can spot more bugs while on a more important load. I don’t want to make it a big deal or anything. It’s just a project I did on my spare time. I hope you have as much fun using it as I had coding it. Join the fun in the Main Room! And hit me with your comments. Today I’m demoing the heart of OpenKiwi. Within a kiwi room you can send links, emails, code, images, videos and all without having to care about strange formatting syntax. Although you can use textile markup. Subscribe to the mailing list to be part of the first people to use OpenKiwi. I hate IM softwares! A couple years ago I was using mIRC like a freak day and night then I switched to MSN Messenger then got sick of it, really. I haven’t opened any of my IM accounts for two years now. IRC was a good step forward of BBS in the 90s, but let’s be honest, sending files it as mess, so is text formatting. IM programs, in the opposite, have become so blotted with useless features. And sending files is not that easy, doesn’t work all the time and is bloody slow. But all those are desktop softwares, you have to install something on your computer. If you’re at school, at work, anywhere else you’re home computer, don’t even think about it. Once you get it installed, you have to enter a password (another one), wait for it to connect and as a reward it keeps popping messages when you’re demoing something to a customer. 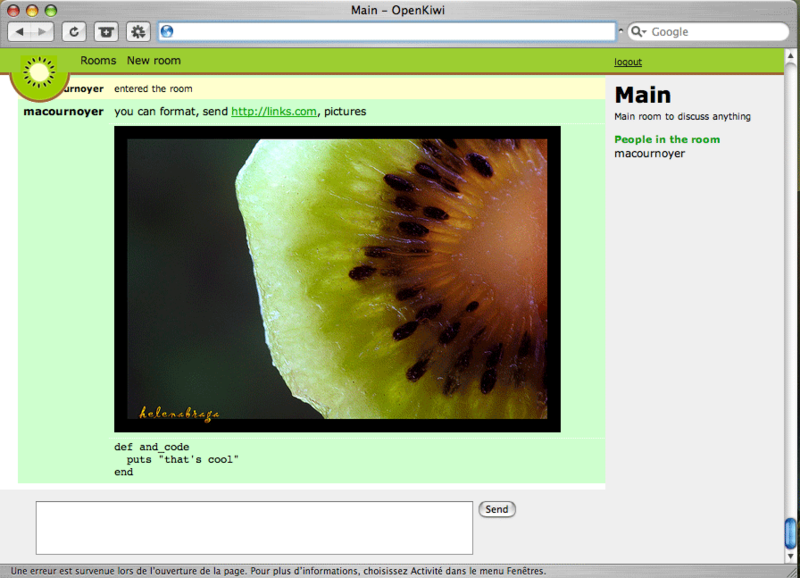 OpenKiwi is a free minimal web chat service. It only does text chat, nothing more. But since the chat log is a web page, you can share files, pictures and videos easily and fast. Nothing to install, no server to find and connect to. Send the link to your friend by email or link in your blog. Be sure to subscribe to the mailing list to be informed when we launch : http://openkiwi.com. Earlier this week I’ve blogged about a new web service I was working on. For the following weeks I’ll be revealing features of this service. For now you can subscribe to the mailing list by visiting openkiwi.com.